This restaurant in Parramatta utilises 2 dumbwaiters. One for moving meals from the kitchen to the dining area and the other dumbwaiter for sending dirty items back to the kitchen for cleaning. In addition to these 2 lifts, a trolley dumbwaiter was fitted to move inwards goods from a ramp access from the opposite side of the kitchen. 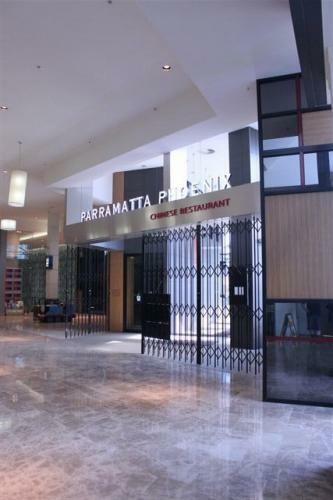 A Parramatta Chinese Restaurant which can serve 500 people. The restaurant has 2 levels, with the kitchen on the lower level, additional dining on the second level – 2 dumbwaiters service this area. Access to the kitchen was restricted to carrying stores from a sub level upstairs – so a trolley lift is used for this purpose. 3 dumbwaiters were requested to be fitted – one is for meals to be transported from the lower level kitchen to the upstairs dining area, the second dumbwaiter is used for transporting goods and the third moves dirty items and rubbish back down to the kitchen. The stores lift, which is required to transport goods from the access ramp through a south facing entry, then goes up around 1 metre to be moved out the opposite north side. These dumbwaiters have become a vital tool for the staff. They quietly and reliably perform a variety of transportation tasks. They have eliminated the hazardous task of transporting heavy goods to the kitchen and carrying meals upstairs to the dining area.